Thsh-Panel-Door-Inward-Opening-with-Spy-Window_3D_full-doore CS 86-HI door system with spy window ... full door and detail (right). With the existing CS 77 and CS 86-HI systems, Reynaers has already made a significant impact on the safety and stability performance standards of doors, says Ali Khalaf, managing director of Reynaers Middle East, the regional office of the Belgium-based aluminium systems provider. Both systems now have been updated to create unique designs of entrance doors and improve the insulation and weather performance. Apart from enabling clients to use full door panels, they can also opt for a spy window without any visible seams in the door. As the contractors and designers are free to choose their own suppliers for the doors’ internal and/or external panels, these extensions allow them more freedom in terms of material, colours and texture, among other aspects. To ensure quality, the panels are glued with a special insertion profile to avoid the weaker technique of gluing one lacquered surface on another. This technique makes it particularly well-suited for more severe climatic conditions. The maximal dimensions of 2.5 by 1.1 m and its 3-mm aluminium panels with 30-mm polyurethane (PU) insulation, make a minimalistic, sleek contemporary design possible. Fully integrated hinges increase the design appeal. 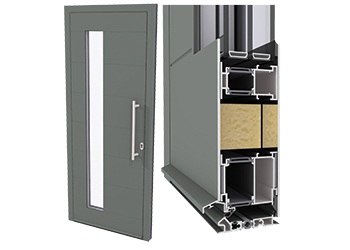 Moreover, the designer door can be equipped with an integrated door-closing system and can be fitted with a finger scanner for controlled access to the building. It is also fully compatible with Reynaers’ beautifully styled range of Purity door handles. “With its two-sided flush panels, the system assures better insulation values as a result of the extra thickness of insulation material. The use of asymmetric thicknesses of the insulation material for the door’s inside insulation also offers exceptional levels of acoustic insulation,” says Erik Rasker, technology manager at Reynaers. He continues: “The system’s insulation concept improves its thermal performance from a Uf of 1.9 down to 1.4 W per sq m K resulting in a Ud of more than 0.8 W per sq m K. This makes it one of the most energy-efficient systems available and ensures lower levels of heat loss and superior energy conservation. And the additional extensions to both systems include a high quality bottom solution with new corner end pieces for improved water-tightness. The CS 86-HI system has also been awarded the Minergie component label. “This reputable Swiss product label recognises Reynaers for its efforts in the field of sustainability. For the architect, owner, fabricator and builder, the use of certified and tested Minergie-labelled products offers more comfort and helps projects achieve their sustainability objective. They can rely on the quality of these certified products and save substantial time and costs by eliminating the calculations that are required to obtain building certifications. Adopting such low-energy concepts results in future-proof solutions towards a cleaner and greener planet,” says Rasker. Rasker believes the latest extensions are indicative of the company’s desire to remain the technology leader as market needs change. “We are on a consistent and continuous drive to remain aware of market needs in terms of architectural aluminium solutions and to adapt our existing range of products swiftly and effectively where and when this is called for,” says Rasker. Headquartered in Duffel, Belgium, Reynaers Aluminium provides innovative and sustainable architectural aluminium solutions including a wide variety of window and door systems, curtain-walling, sliding systems, sun screening, conservatories, skylights, screens and systems to incorporate blinds and ventilation grids. Besides offering an extensive range of standard solutions, the company also develops solutions that are tailored to individual projects. Established in 1965, the company has offices in more than 30 countries worldwide.